Spark Corps is a design non profit at the intersection of design and social impact. We believe in providing professional development and mentorship to young designers while also creating high quality design work for non-profits and social impact organization. To do this, we pull on our strengths in visual design, critical thinking and global awareness. This skill set allows us to communicate the needs and missions of our partners while also allowing us to develop designs that provoke thought and inspire change. We also believe in providing services to all groups that produce work for social impact, regardless of social, religious, and economic identifiers. We find it important that the organizations we partner with also reflect these values. A joint project between Book and Brunch, Sparkcorps and Orange Sparkle Ball. Special thanks to MODA (Museum of Design Atlanta) and Toronto Offsite Design Festival. 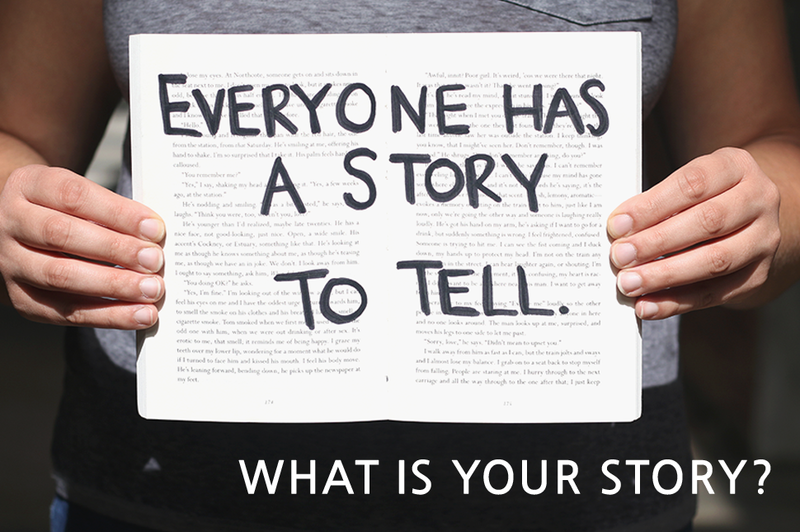 ‘What is your story?’is a project that includes events, a window installation, and an interactive Instagram exhibit aimed at showcasing a fraction of the many stories that real people all over the world are too afraid to say out loud. Viewers can read the anonymous, handwritten stories in books and respond to them, using postcards that will eventually be sent back to the original writer. This back and forth interaction creates a connection and an understanding of solidarity. The person who initially shared their story ends up receiving responses to it, indicating that their voice was finally heard. During Spark Corps apprenticeships, senior designers work with emerging designers and creative to polish their design chops. We also provide apprentices opportunities for professional development andengagement with our partners. We work with local and global change makers to attack social problems and design solutions that will benefit the communities our partners serve. We aim to build long term relationships with partners as we invest in their missions. To measure the impact of our work, we document our process through our Sketchbook. This allows us to highlight the behind the scenes work of Spark Corps, as well as our works impact on our partners and the communities they serve. Spark Your Design Creativity is an activity book that introduces kids to design while also helping them to build skills to foster creativity and 21st century thinking. This Summer, our design apprentices led a Kickstarter campaign raising over $7,000 to get our first shipment of 500 books! Purchase Spark Your Design Creativity at the following retailers! A narrative illustration of everything Spark Corps has accomplished in the past 12 months! Each year, our team crafts visual summaries of our work, achievements and future goals. We do this to both share our successes and challenges with the community as well push how nonprofits can communicate their programming in an innovative way. We are proud to showcase the 2016 review! Over the 2015 year, we accomplished some truly incredible things. We build relationships with new partners, developed our design education beta curriculum and grew our impact in Atlanta. 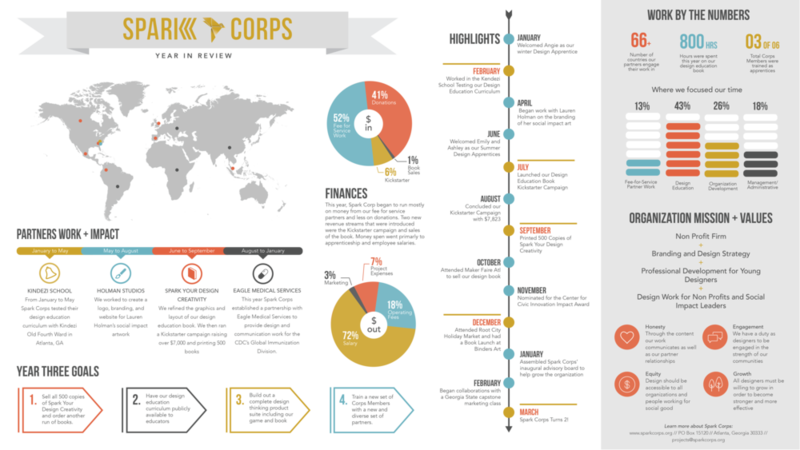 In the summer 2015, Spark Corps welcomed its first class of corps members via an 8 week beta program. During the program, Orange Sparkle Ball shadowed Allie Miller and Grace Cha to document their experience.